The perfect flats boat doesn’t really exist, but for every angler there’s always one that comes close. Over the years I’ve owned five different skiffs, from a beat up Gheenoe to a top of the line Maverick Mirage. They’ve all had their merits but my current boat is the one that comes closest to being perfect for my type of fishing. Here’s a quick rundown of how I have it rigged. For the last two years I’ve been guiding out of a Beavertail B-2, this is an eighteen foot skiff made in Avon, Minnesota, which is more than a thousand miles away from the nearest redfish. Beavertail, originally a duck hunting company, has almost perfected the technical poling skiff over the past five years. Since the majority of my anglers are looking to sight cast with fly rods, the five hundred pound B-2 is about as quiet and easy to pole as a flats boat can get. With a full tank of gas and two anglers it floats in only six inches of water, which is shallower than most redfish will ever swim. I ordered the Beavertail to replace the older Maverick Mirage I was using down on Vieques, Puerto Rico. There were no boat ramps close to where I fished and the Maverick was too heavy to launch off the beach. With the Beavertail I could back right down on to the sand and have a five minute run to the island’s best bonefish flats and it would prove just as useful up here in Florida. The B-2 that I bought was a very basic model with a side console, trim tabs, and not much else. I powered it with a fifty-horsepower Yamaha two-stroke outboard. I learned the hard way with my Maverick that owning anything other than a Yamaha outside of the Continental U.S. is asking for trouble. Almost every single boat you see bobbing around the Caribbean is sporting a Yamaha. They’re incredibly reliable and parts are available worldwide. With only fifty horsepower, my B-2 is no rocket sled. It will hit thirty mph wide open, but I never needed to travel more than four or five miles to get to the fish on Vieques. I plan to eventually bump the power up to a four-stroke sixty for the longer runs that I need to make here around Pine Island. After I shipped the Beavertail back to Florida I made a couple more additions that I think are must haves for this area. The first thing I added was a Garmin 440s. This full color GPS/Sonar unit comes loaded with charts and tide tables for the entire coastal U.S. and the Bahamas. Technology like this didn’t exist for small boats when I first started guiding and I really like marking the schools of baby tarpon I find way up in the local mangrove creeks. The second thing I added was a trolling motor. It’s rare to see a small boat in this area without one but this is something I didn’t need it when I had the skiff sent to Vieques. Chasing bonefish by boat in shallow water and high winds requires someone on the poling platform at all times, and that person was always me. If I wanted to catch a one on my day off I did it on foot. The flats up here around Pine Island are far more expansive and a trolling motor is a must for exploring new spots. The Beavertail’s light hull allowed me to rig it with a lower thrust and less costly unit. I chose a fifty-five pound thrust Minn Kota Riptide which only requires a single battery, saving me a lot of weight on the bow. Another must have for this area is a shallow water anchor system. Just about every flats or bay boat in Southwest Florida now sports a Power Pole. This is one of the best inventions for boaters in the last twenty years, allowing you to stop and hold position in up to eight feet of water at the touch of a button. I don’t know anyone who owns a Power Pole and is not totally satisfied with it. Beavertail offers them as a factory installed option but I didn’t order it and wish I had. The $1500 cost was a serious issue at the time but it would have been money well spent. For now I use a Stick It Anchor Pin. This is an ingenious piece of hardware that I call the “Poor Man’s Power Pole.” The Stick It is a simple eight foot composite spike with a nylon lanyard and a T handle at the top. You simply shove it into the bottom and tie it off to the bow or stern. This holds a light skiff almost as well as a Power Pole but only costs $90. It’s an easy and indestructible alternative and also a great backup system for larger boats in the shallows. At some point, however, I will add an eight foot Power Pole to my Beavertail. Finally, the one piece of gear on my boat that gets more use than any other is my graphite push pole. By my own rough estimate I’ve spent at least twelve thousand hours on a poling platform over the last fifteen years. That’s almost five hundred solid days with a push pole in my hands. I’ve owned only one model for the past ten years and that’s a twenty-one foot Stiffy Hybrid. These Texas made push poles are the best on the market and at $700 they’re not cheap. They are well worth the money. This is the one thing I consider indispensible on my boat and I wouldn’t consider using another model. So that’s a quick rundown of how I’ve rigged my boat for fishing around Pine Island. I’m not endorsed by any company I mentioned above so these were my honest opinions. There are a lot of flats boats currently on the market similar to my Beavertail B-2. Most cost more and some cost less. 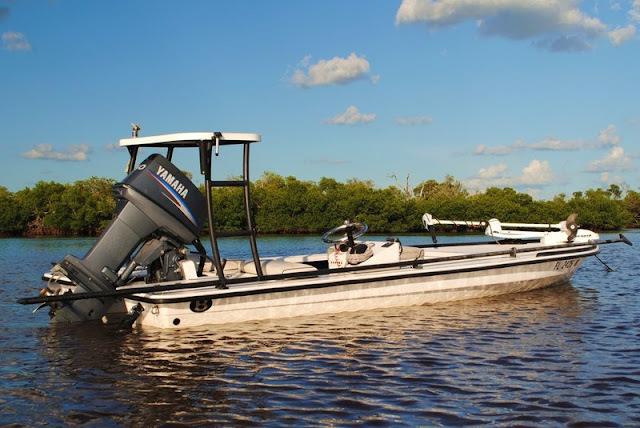 The good news is that if you’re in the market for a very shallow running skiff and the all the gear to rig it for fishing Southwest Florida, you literally have a ton of choices. It’s a great time to hit the flats.